Before today, the last time I had any instruction in oil painting, I was an international student in Germany. That was 40 years ago in East Berlin. 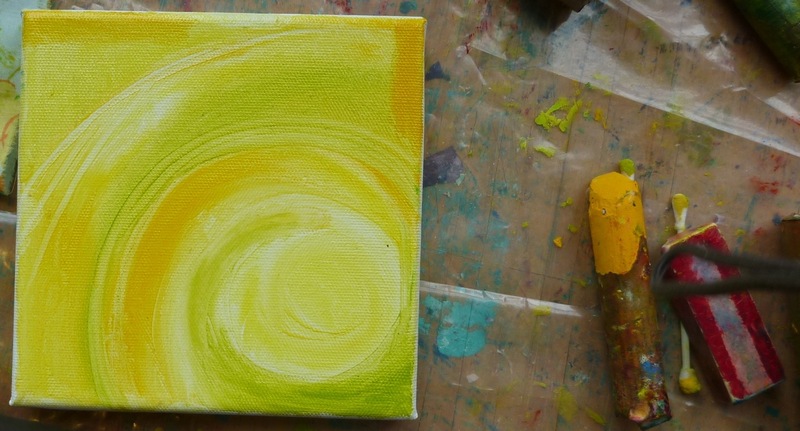 Since then, I’ve been to lots of watercolour , mono-printing and acrylic painting workshops, but never oil painting. I often think of oil painters as fairly traditional realists who use muted colours, whereas I prefer strong colours and an expressionistic approach to my subject matter. Wayne Boucher's Studio is in a former classroom in Parker's Cove. Last weekend at the Annapolis Region Community Arts Council (ARCAC) Annual General Meeting, I ran into Nova Scotia’s celebrated painter Wayne Boucher who breaks all of my stereotypes about oil painters. 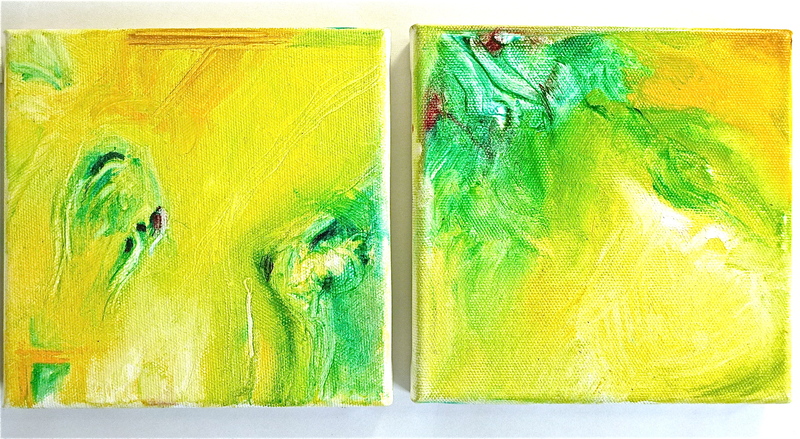 His work is bold, abstract and etherial. 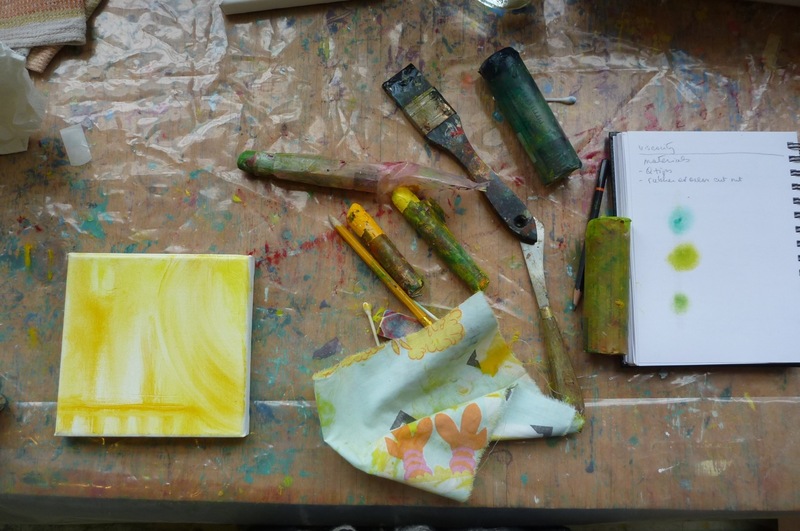 He loves colour and has a background in printmaking, which I think informs his choice of method and materials. 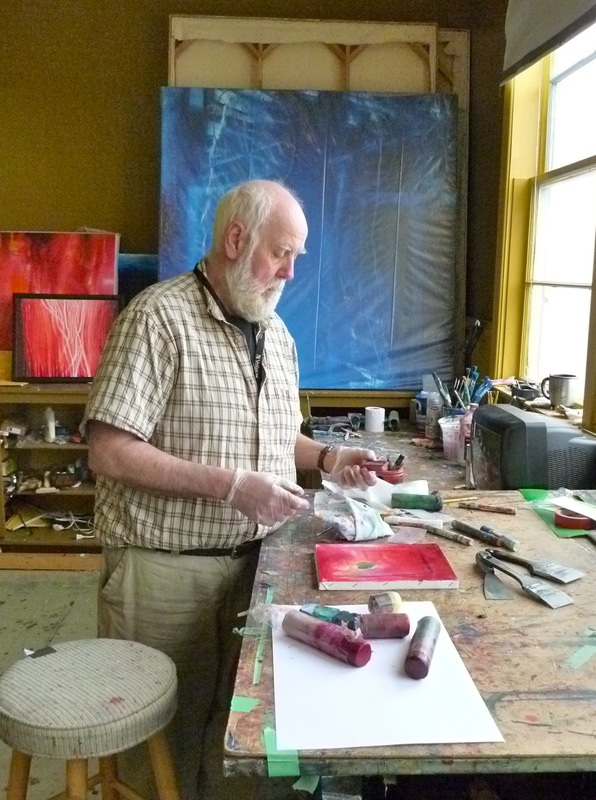 Wayne is a founding member of ARCAC and decided to offer a fundraising workshop in his studio, which just happens to overlook the Bay of Fundy. Wayne's demo piece. Oil sticks, Marking tools and not a paint brush in sight. I signed up at once because I have been curious for a long time to find out how Wayne creates that luminosity in his wall-sized paintings. So this morning I packed up my supplies and drove up the Parker Mountain Road, through the forest and the fog to the Bay of Fundy. My luck would continue to multiply upon hearing that the other workshop participants had all cancelled. This is how I came to be tutored for a day in Wayne Boucher’s studio while he worked on a piece for an upcoming show he’s having at Ingrid Mueller’s Art and Concepts gallery in Fredericton, New Brunswick. It’s always interesting to find out how other artists operate; what their thought processes are, their approach to their work, their strategies and their inspirations. Wayne starts his workshops with an explanation of this. He writes a lot before starting a new series. 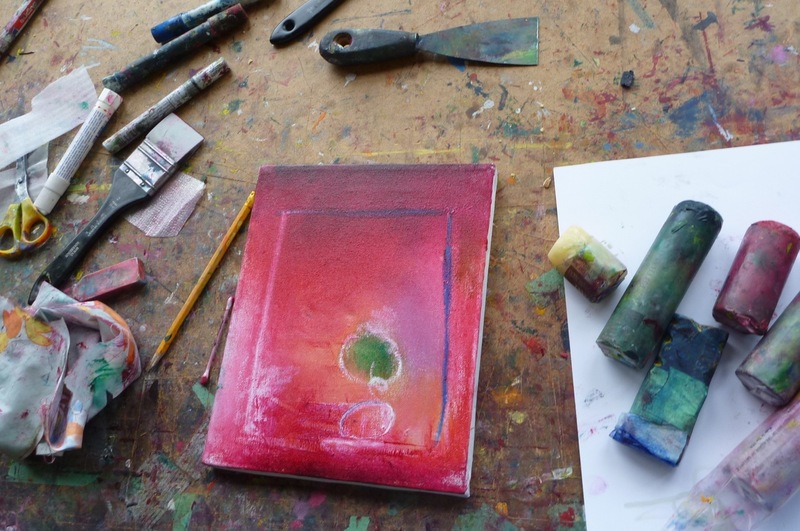 His bound sketchbook is filled with words, graphs, diagrams and sketches about the paintings. He calls it his “Ideas Bank” and it is his recommended process before starting any new painting. The biggest surprise for me was seeing the materials that Wayne uses. He rarely uses a brush, preferring to blend colours with his hands (and latex gloves), with rags and to mix colour directly on the canvas. He uses Q-tips, pencil erasers, squeegees and anything that will create the texture, line or blend that he needs. Watch Wayne drag a ribbed sock across my practice piece to illustrate what can be done and to help free up my representational mind set! His approach is very tactile. He Moneygram online uses B & F oil sticks almost exclusively. He starts by covering the surface of the canvas with a blending stick, which is a clear painting medium. This allows the coloured oil sticks to be blended together and to glide on the surface. It also means that the paint can easily be scratched, wiped away, masked and manipulated to reveal the ‘light’ of the canvas. My first attempt. Looking at the final works, I can't tell anymore which one was this was! 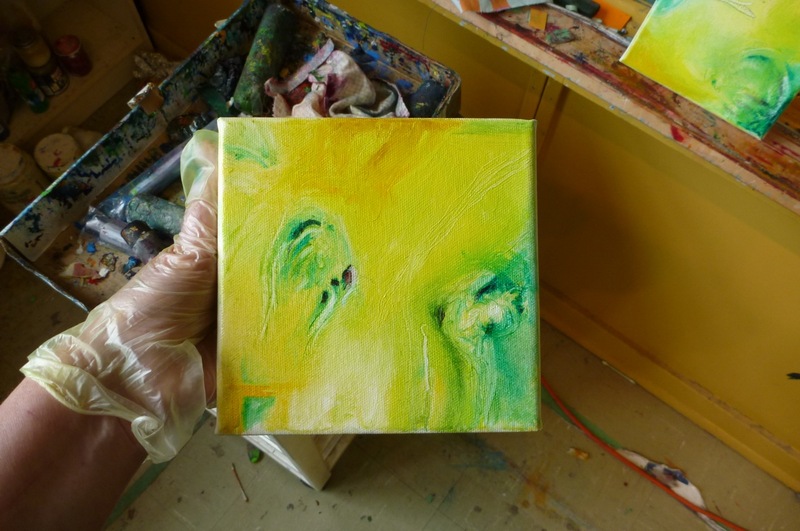 It was difficult for me to refrain from turning each little painting into something representational. I kept ‘seeing’ landscapes and flowers in my work. In fact it was impossible for me to entirely avoid creating organic shapes. Which is fine, because I love to work with organic shapes and to paint my surroundings, and now I can do so while trying out the tools and approaches that I was introduced to today. I kept seeing seeds and onions everywhere! It was totally inspiring to stand in Wayne’s studio, surrounded by his colourful works with the Bay of Fundy out the window. At lunch we talked about Germany. Wayne gave me a beautiful, glossy gallery catalogue from a show that he and other Atlantic Canadian artists were in. The show was in Germany which I found to be very serendipitous considering that my last instruction in oil painting occurred in Germany in the 70’s. It seems that life repeats itself like the tides going in and going out. Rainy Bay of Fundy day. What an experience to learn from Wayne – what an artist he is. I have a piece from him which is exudes such luminesence that I swear it glows in the dark! I know!! I felt like it was my birthday or that I’d won the lottery. He is also a great guy who is very generous and sharing about his knowledge. I’m still flying with images of the studio in my head and working on a piece inspired by yesterday. did with them. What a braveheart you are. Super work and a great blog. Barbara, you would LOVE using oil sticks this way too. Those huge ones are amazing….and expensive…$40 to $80 dollars each. But the pigment load in them is quite impressive. The B & F has great coverage…even the white stayed on the colour when wet. I’ve got a few Winsor Newtons, but they don’t quite have the ‘omphff’ of the B & F’s. The most important part of it all is the blending stick…it is to the process as matt medium is to acrylic. 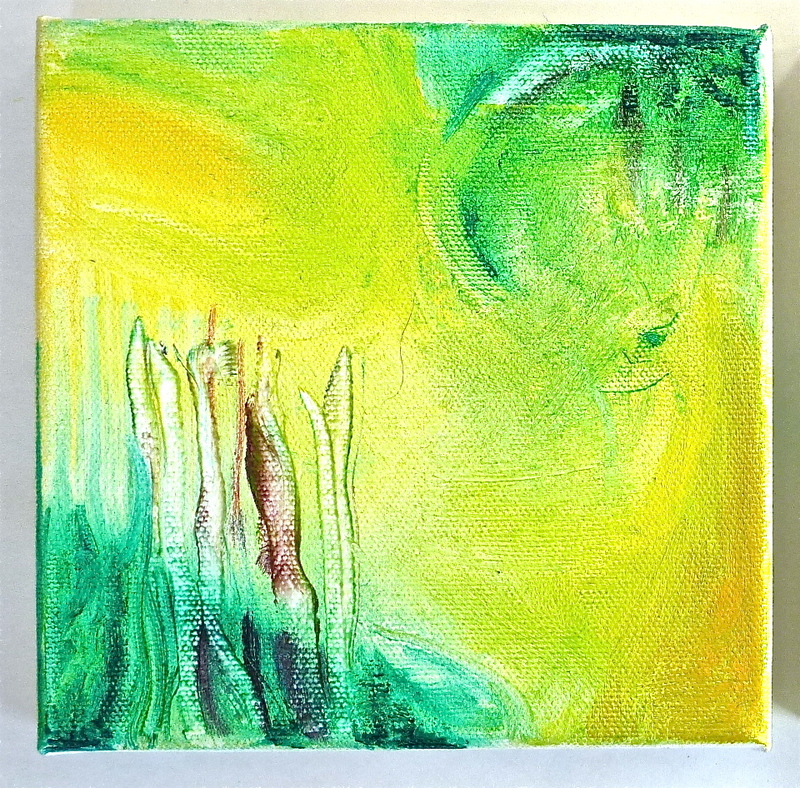 Love what you created under Wayne’s tutelage – the greens & yellows and the shapes shout “SPRING!” and new growth to me. I just happened to see Wayne Boucher’s work on display at Sainte-Anne University, a first for me. I was pulled into the gallery like an iron filing to a magnet, just astonished by the size of some of the canvasses, by the colour, and, as you said, the amazing luminosity he creates. I couldn’t tell you now what performance we saw that night – which is why we were there – but I sure do remember the paintings! Wow. Thanks, as always, for the interesting blog posts. Faye, that’s a fabulous story! Seeing the art in person is so powerful. I like to get up really close to read the clues as to how it was done, but even watching a painting get painted doesn’t ‘teach’ you to be able to do what that person is doing. There is still an illusive magic about that person’s touch that cannot be captured. I remember the first time I was in London visiting a major art gallery and taking a close look at my favorite impressionists’ work. I could see the canvas through the paint in places and see lsyers of paint underneath and see a history of the development of the piece that was never obvious in book reproductions. Of course now we have the internet and it is easier to ‘see’ detail in a work. Faye, was the performanace you went to in French or English? I didn’t realise they have performances there. I’ve heard that there is a printmaking studio that people can join for $50 a year. I’d like to look at it sometime. Flora, the performances we’ve seen so far have been in English (and Tuvan!) with usually bilingual introductions. You can see upcoming & past shows at http://www.lemoulin.ca and you can subscribe to a newsletter from same. Coming up in April are Corey Harris (at the Clare Social Club) and Circus Incognitus at the university theatre. Yes, I agree, art ‘in person’ is sometimes knock-your-socks-off powerful! Faye, thanks so much for the link! I have subscribed to the Newsletter. We are very lucky here to have a Music Society and a couple of great venues that combine to bring us wonderful events. The volunteerism in this community is really amazing. The weather is wonderful….warm and no black flies yet. love it. the abstract quality and the outlines what fun you must be having. Lucky, lucky you! (But what’s up with all those people who cancelled?) I am going to have to add a ribbed sock to my material list.